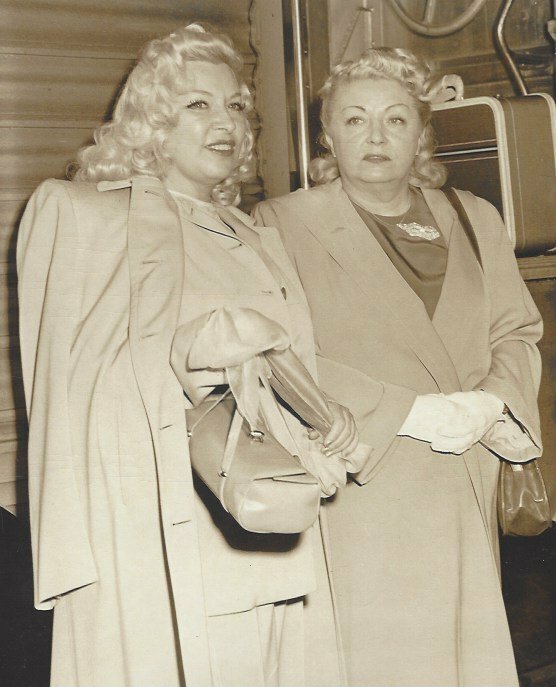 The friendship between MAE WEST and Dolly Dempsey (who died on Thursday, 2 November 2006) is well-known. Learn more about this life-long friend today. There's so much that most people don't know about Dolly. This is Part 1 of two parts. • • Margaret Anne (Dolly) Lyons Dempsey, who was born in Newark, New Jersey, was the oldest child of six children of James and Marguerite Lyons. • • Dolly spent many years working at the San Diego County Health Department, then went on to work for Dean Whitter, and finally as the secretary to Dr. Love, President of San Diego State University. She was one of the Charter Members of the S.D. Humane Society's Women's Auxiliary and spent many years helping with the various activities they hosted. She was an adamant supporter of those organizations that fought for animal rights. 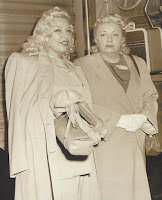 • • Her loving friendship with Mae West began when Dolly was in high school at Our Lady of Peace Academy. This friendship continued throughout her adult years. • • The second half will be posted on Monday. • • Source: The San Diego Union Tribune; published on Tuesday, 7 November 2006. • • Musician Klaus Schulze recorded a long track "Face of Mae West" [08:04] for a sampler CD titled "Dalí: The Endless Enigma" and this cut was first released on 2 November 1990 on the Coriolis label. • • Alice Brady, a daughter of an eminent Broadway producer who waged a battle against censorship, was featured in one motion picture with Mae West. • • A California paper mentioned Mae West. • • But if your fat is your fortune, as in the case of Mae West, that’s a different story! . . .
• • The Mae West Blog was started fourteen years ago in July 2004. You are reading the 4076th blog post. Unlike many blogs, which draw upon reprinted content from a newspaper or a magazine and/ or summaries, links, or photos, the mainstay of this blog is its fresh material focused on the life and career of Mae West, herself an American original.